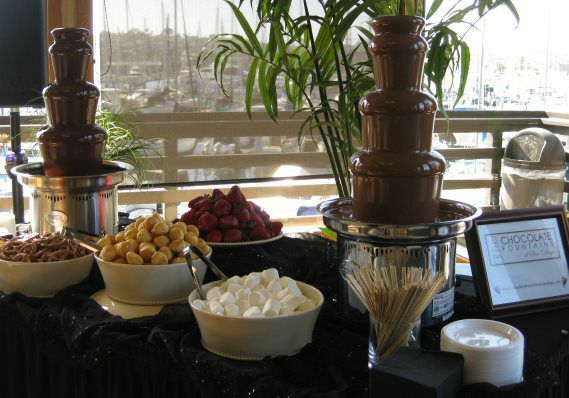 Rentals include use of fountain for as long as requested, chocolate, skewers, dessert napkins and pick up at designated end time. To ensure enough time for set up, the fountain will be delivered 60 – 90 minutes prior. Your fountain will be picked up at the time you designate. Our large supply of fountains allow us to put together any combination, if you don’t see what you are looking for, let us know what you had in mind! Fountain Attendants ensure the fountain stays running smoothly, maintain the table and assist guests. 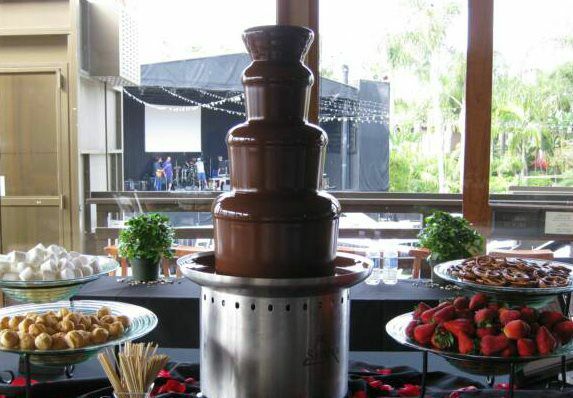 The attendant will set up the fountain (and dipping items if selected) and stay with the fountain for the duration of the event. All attendants have experience in food service and are food safety certified. Attendant for your event: $ 150 flat rate. Fruits and snacks are always fresh and of the highest quality. Your selection of five dipping items includes serving/display bowls and platters in a variety of colors to match the theme or decor of your event. Dessert plates and napkins are also available upon request at no additional cost.